The Muslim Student Association has two goals, said club president Sebghattullah Noori. One is to establish a community for Muslims on campus, while the other is to rase awareness of Islam and Islamic culture among non-Muslims. “Our aim is to inform people that all religions are intertwined in a way, and we are all brothers and sisters,” Noori said. The MSA wants people to be informed about the true Islamic culture and not to perceive all Muslims as being “terrorists” or affiliated with the Taliban, Noori said. On Tuesday, Oct. 9, MSA members will be in the hall in front of the Union offering international sweets to help raise money for the club. Raising money for countries in conflict, such as Syria, Egypt or Afghanistan, is a goal of the club, Noori said. This semester the club also has access to a prayer room, which is available to everyone, on the first floor in the library, in room 101. This prayer room is beneficial because it provides a place for students to reflect, meditate or pray, Noori said. 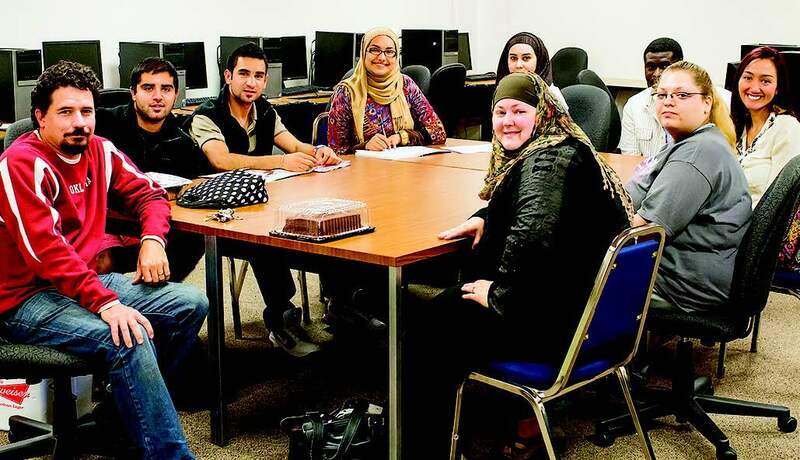 The Muslim Student Association is one of five religious clubs on campus, and is open to all students regardless of faith, religion or beliefs. Currently the MSA is 55 members strong and is always eager to welcome new faces, Noori said. One new member is Nawar Salam Al Rbeawi, a sophomore petroleum engineering major from Baghdad, Iraq. He said he came to Oklahoma in January of 2008 with his father, who received a government scholarship to complete his doctorate in petroleum engineering. Al Rbeawi decided to continue his education in Oklahoma to get the best education possible like his father, he said. He said he would like to play a part is helping Americans better understand Islamic culture and values. Muslim Student Association meetings are held every other week at 12:30 p.m. on Tuesday. The next meeting will be Oct. 16 in the prayer room, room 101 in the Library. For more information on the Muslim Student Association, contact Noori at sebghattullah.noori@email.occc.edu.